Natures Valley is a small holiday village tucked into the valley at the bottom of the Groot Rivier Pass . In days gone by the national road to Durban passed by the village so many people knew about it. Today however a toll road has been built through the Tsitsikamma and the two passes, Groot Rivier and the Bloukrans are now seldom used. To reach Natures valley one has to travel through Plettenberg Bay and about 20 kilometres to the east at the beginning of the toll road is a turnoff to Natures Valley. Before you reach the pass you drive through some farm lands and then along the top of the rolling hills and valleys before reaching the Groot Rivier Pass. Driving this pass is not for the faint hearted. It has many sharp bends and blind corners with sheer cliffs on one side and deep drops down into the valley on the other. In places there are minor rockfalls where loose rocks have been washed down onto the roads. The valley is filled with indigenous trees, such as yellow wood, stinkwood and many others. It is real jungle territory with long vines growing between the trees. Many of the trees are so tall that you drive under them as you make your way down the pass. Once you reach the bottom of the pass you come across the village between the road and the sea. The village is filled with holiday homes of all shapes and sizes. Some built of wood, others of brick and mortar. Many of the houses have been built between the trees that were growing on the plots when they were purchased. Consequently some of the plots are very overgrown and shady. As you enter the village to your left is the lagoon which is open to the sea in the winter months when the river is flowing but closed during the summer. This lagoon often floods the plots and roads in its vicinity. There are also many milkwood trees in the area. These are protected and are not allowed to be cut down. There is only one little shop in the village and it is found near the beach. Natures Valley beach is very beautiful (see picture below) with lovely golden sands and sand dunes on the landward side of the beach. 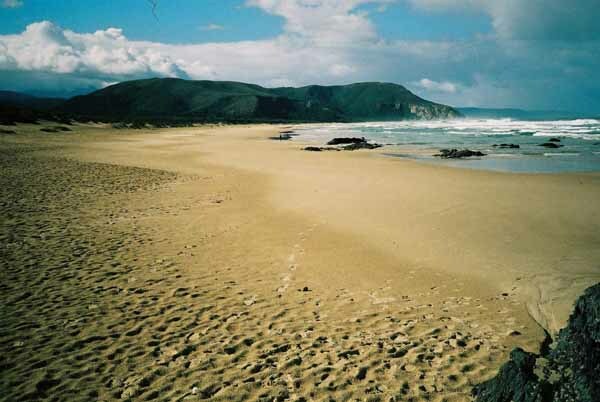 On the eastern side of the beach where the lagoon enters the sea is the start of the Otter Trail which is a five day hike along the coast as far as the Storms River Mouth. It's a lovely walk along the hills and valleys of one of the most scenic parts of the SA coastline. On this trail there are a number of huts that provide accommodation for sleeping and eating and not much else. One has to carry all your own bedding and food with you when doing the trail. There are also a number of river crossings along the way and one has to swim some of them to cross. This can be quite daunting when the rivers are flowing strongly. The beach at Natures Valley is safe for swimming and is also good for fishing. I've spent a couple of hours fishing there and had quite a lot of success catching a real mixed bag of fish. As you leave the village and make your way up the eastern side of the pass look out for antelope amongst the trees. You might even come across a couple of them standing in the road. If you approach them slowly you can get close enough to take a photograph. The view from the top of the pass looking down onto Natures Valley is quite spectacular and many people stop at the lookout point to take a few photographs. What really makes Natures Valley is the nature, and the relaxed atmosphere you will find there. It's a place to visit for an hour or two on your journey up the coast or if you have a place to stay for a couple of days. Either way stop off on your journey and visit the area.